It’s almost impossible to truly estimate how many different products you could find at any given flee market, swap meet, or crafts fair. Items ranging from hand-sewn wallets to antique cars and coins entice buyers at a variety of venues across the state. Edible items, however, often are the merchandise most appealing to a broad spectrum of visitors. Yet the food at these markets, no matter how delicious the samples may be, doesn’t sell itself. The salesmen or saleswomen at each of these booths are who bring the pleasure associated with their products, and the woman selling Randol Honey is no exception. 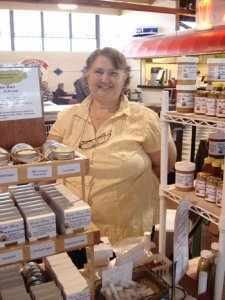 Pat Randol would seem like any other average Iowa woman when first meeting her, but spend a few minutes talking to her at her Randol Honey Farms display at your local farmer’s market, and you’ll have a great time getting to know a very special entrepreneur. This business’ success has not been without personal sacrifice on behalf of Pat and her husband, Tom, but you would never know that if you stopped and enjoyed both a sample of Pat’s honey and a second or two of conversation.